When I posted my recipe for Ostrich Fillets with a Red Wine Jus there were a few questions as to where, what, how. So I thought I would share with you some interesting facts from the Ostrich South Africa Website. Oudtshoorn, in the Klein-Karoo (Southern Cape) is the ostrich capital of the world. Meat, is exported mainly to Europe. Because of the meat’s health characteristics ( almost no fat and cholesterol), it is a sought-after product. Ostrich is a new addition to my kitchen. It is readily available in our supermarkets, but I have not really been enthused about it until I started treating it like game, instead of beef. If you do manage to find some, I hope you will buy the meat and try it. Looks very interesting! We don’t eat ostrich here, I’ve never seen it in the stores at least. Hmm, didn’t know Italy used so much ostrich! And love the facts about ostrich–but oh no, now I have another question–what’s a clemengold? Same question, what’s a clemengold? A citrus? A clemengold is a South African grown clementine 🙂 I will blog more about them! Oh, they sound delish! I love clementine, so an exotic (well, to me 😀 ) Clementine sounds even better! Unless I grow them myself I am never going to find ostrich meat here, i had it is NZ though and it was good.. this recipe looks good too! I love ostrich! I always buy beef-ostrich mince because it is lower in fat! This recipe sounds wonderful! 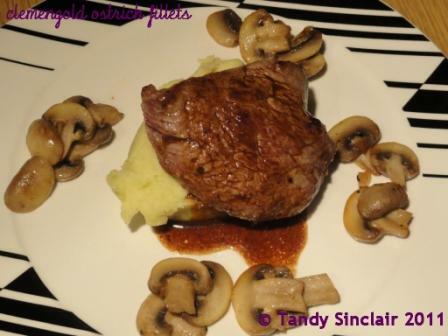 Another great ostrich fillet recipe Tandy! Sounds delicious with the citrus and ginger flavours!